Since I started my fitness journey in 2012, I have tried to one big race every year. So far, I’ve done a sprint triathlon, two metric marathons (26.2 kilometers), a Ragnar and a marathon. They all have been rewarding in their own way. My favorite was my first metric marathon. 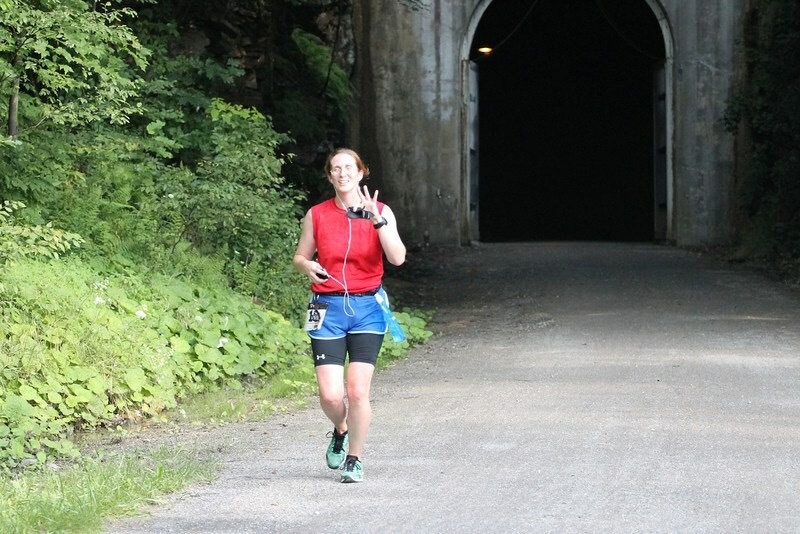 I had just gotten out of the half mile long Big Savage Tunnel on the Great Allegheny Passage. As this breathtaking view came to me from the top of the mountain, I smiled. August 2013, Race for the Gold metric marathon. That smile didn’t leave my face until I finished. I didn’t stop smiling until I hit the finish line. I was in that weird, zen-like state that few runners achieve. I knew I was pushing myself harder than before. And it was the best thing that ever happened to me besides marrying my husband and giving birth to three wonderful, in their own way, kids. 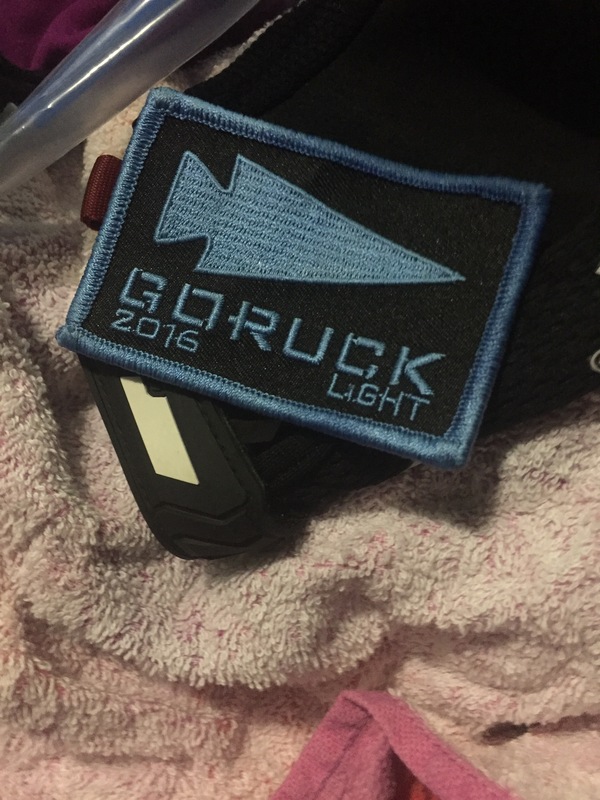 This year, I learned about an offer by GORUCK to Team RWB members. Sign up for a race for free it said. So I go a code and picked a date. Fall gave me enough time to train. GORUCK Light Pittsburgh would be nearby. So I signed up. If you’ve been following this blog, you’ve followed my training. Sometimes it’s great, other times borderline awful. I tried to approach it by attending the recommended training center, a GORUCK-sponsored group in my hometown. It usually met on Monday mornings and added a Thursday night program after my training program started. Soon after the Thursday night program started, the Monday program, which I could attend, stopped. I couldn’t meet on Thursday, so I worked out alone. Not having a group or coach to help me learn about the kind of training I was doing and keep me motivated, didn’t help my progress. But there were many times when a workout so knocked me out that it took several days to recover. Also, not a good thing. Going into this event, I knew my legs could handle the ruck and whatever other test they were in. After all, I’ve done a marathon. But my core and upper body? I was worried, very worried, that my upper body wouldn’t be able to deal with it. 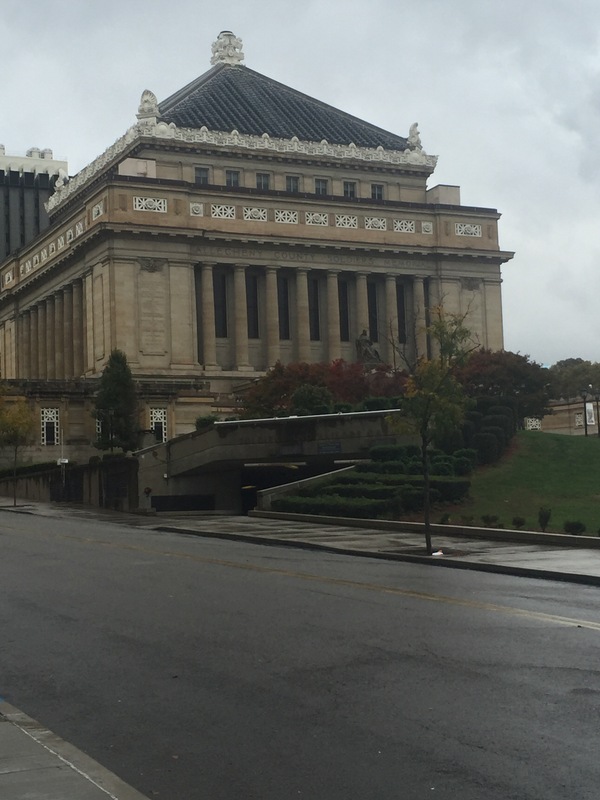 The Soldiers and Sailors Memorial Hall in Pittsburgh. 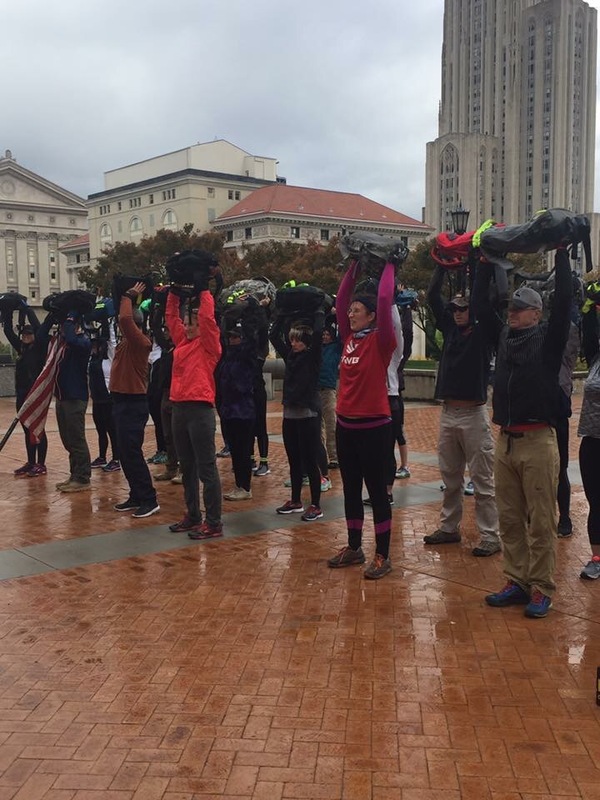 GORUCK Light Pittsburgh began at the Soldiers and Sailors Memorial Hall in Pittsburgh, Pa., located in the middle of the University of Pittsburgh campus. Since I had to drive from West Virginia, I came about an hour and a half early, so I could find decent parking and make sure my supplies where ready. If you read my pre-event Blog post, you’d know how I felt before the start of this event. I wasn’t in a good place. Before I left, my husband told me to concentrate on what I can do and not on what I can’t do. It proved to be very sound advice. I listened to Sia’s new album “This is Acting” on the way up. The songs, especially “Unstoppable” and “The Greatest,” put me at ease for the most part. But “Bird Set Free” proved to be the event’s song. After I parked, I tested my hydration bladder, a required part of the GORUCK equipment that I mention in Part 1 of my race recap. It didn’t work, so I headed to the Pitt bookstore and picked up a water bottle to go with my Team RWB water bottle. I needed 2-liters of hydration. And I always drink more than usual during races. However, if I had to do it again, I would have tested my hydration pack earlier during my training and bought a replacement. It’s hard to swing a 20-plus pound backpack around to pull out a water bottle when you’re constantly moving. I think everyone else drank at will while I had about three good drinks out of my bottles. After the bookstore visit, I went to the hall which is also a museum. It’s a beautiful building with an auditorium in its center and exhibits ranging from the Civil War to modern-day military efforts in Afghanistan. There were some people there for the event and we chatted as we waited for the other team members arrived. It has rained most of the weekend and event day was no different. The forecast called for no rain, but it did rain on us for a good portion of the event’s start. Each team is required to have a flag and a team weight. Our weight was under the 20-lb. requirement, but various members carried it throughout the event, like the flag, never letting it touch the ground. Four members of our team were going for their HTL badge, working to complete all three events held in Pittsburgh that weekend. They were haggered and weary but were a valuable asset to our team. Twenty-six of us assembled into three ranks (rows) at the top of the outside stairway leading to the museum. After checking in, we were introduced to our cadres Michael and Flash. Both were ex-Marines with special operation experience. Michael also served in the Air Force. After introducing themselves, Michael went to all of the legalese, making sure we didn’t have pre-existing injuries, weren’t sensitive to hypothermia, and that we could do the task before us. Then, we took a quick self-guided tour of the museum. The museum is awesome, a great tribute to those who have served. I loved the architecture the most. But I’m like that. One last potty break and we headed back to our ranks. Twenty-seven of us lined up. What? What happened? Someone came in late, so as punishment she had to count all of us within a time limit. After about four tries, she got the number right and she became our team leader for this portion of the event. We did a PT test: 1 minute of sit-ups, followed by 1 minute of push ups, then three laps around the Soldiers and Sailors Hall block. We had to run as a team, with no gaps in our lines. And we had 14 minutes to do it. We did it in about 12 minutes. Then we did bear crawls down the museum’s green way. Bear crawls are like crawling on all fours, but your legs and arms are straight. The right leg and left arm move together and vice versa. Note to future GORUCKers: Wear form-fitting tops, the kind that don’t ride up your back when you’re inverted. The bear crawls were the first time I did something stupid. Someone was trying to correct my form as we stopped between crawls so I wouldn’t get a cramp and so I moved forward with the group. However, the guy next to me was a HTL guy and was very behind our line. I was trying to stay back and help him. I snapped back to her, not the first time during the event, merely due to a misunderstanding. Another note to future GORUCKers: There is no “I” in team. Work together and leave your ego in the car. After the bear crawl, we had a minute to get our gear so our ruck could begin, but the cadres and support had emptied out the weight compartments in our packs. Stuff was scattered all over the rain-covered patio. We gathered everything as quickly as we could, but longer than the time slotted. Note to future GORUCKers: Every time your team fails to meet a time limit or has an infraction (wide gaps in your lines for example) you all are penalized. The penalty could range from more exercises to more rucking. It’s really at the cadres discretion. The first part of our ruck was from the University of Pittsburgh campus to Duquesne University. Our time limit was 15 minutes. There was road construction and debris along our path — tires, sandbags, etc. The cadres used this to the team’s advantage and soon almost everyone was carrying an extra something besides their ruck. For me, it was hard to stay in formation, you have to be able to touch the ruck in front of you. If you grabbed someone’s sandbag, you had to stop, which created a gap. Even if the TL or ATL grabbed the bag and gave it to you, you still had to stop if it wasn’t situated properly. I got a little snarky with a team leader again. But again, I still didn’t have the right mindset. I have never really done well in team settings, so simply doing this event was a challenge. Note to future GORUCKers: If the cadre asks for random animal names, don’t pick snake. For the benefit of your teammates, pick something with legs. So we went out to the 20-yard line as duck, bears and snakes and sprinted back to tag our teammates. I had a really hard time with the snake portion and ended up causing my team to lose. The cadres were yelling “GO RWB! Do it for the red, white and blue.” The entire team cheered me on as I made my way across. It was awesome, something I missed from the Monday workouts. I grinded it out, touching the 20-yard line with my fingers and running back in an “I hate you guys” mood. I still was in a “me” not “we” mindset, and while I appreciated the cheering I was disappointed. I did it, somehow I did the relay and the 75 four-count jumping jacks and survived. I was still a long way away from following my husband’s advice, but I was repeating it to myself more and it was sinking in. Our third set of leaders led us from Duquesne to Point State Park in downtown Pittsburgh. We had to cross the roads together and we got rid of the weights that we picked up earlier in our journey. One of the HTL participants noted that this Light felt more like a Tough. I kind of liked the idea that we were doing something different. Note to future GORUCKers: Every event is different. One Pittsburgh event won’t be the same as last year’s or next year’s. The cadres, weather and terrain will determine what you do. But one requirement at almost every event is getting wet. Dress accordingly, I suggest easy to put on or off layers. Our first trek in the water, leapfrog. Photo from the event Facebook page. Once there, we stopped at the bridge. We broke into two ranks, put down our rucks in nice rows and went into the water. Flash’s original plan was to have us do three activities in the water. But we ended up doing two. We weren’t quick enough getting into the water, so Cadre Michael decided we needed to submerge ourselves at the same time. We all sat down and on the count, went down, back first, into the water. It was so, so cold. It was a shock but it was done quickly. Then we played leapfrog. We leap all the way across to the other side and then ran a lap around the park as a group. Then we had to come back to our rucks, so back into the water. We walked across the water as one group. When the cadres yelled “incoming” we had to drop and fully submerge ourselves in the water. We did it. And began packing back up. The team needed new leaders. And I was finally into the teamwork mode. At least I thought I was. Note to future GORUCKers: During my event, the cadres wanted people who had never participated in GORUCK to serve as team leaders. Your goal is to get to everyone to the destination safety. If you are person who likes to be in the background, like I do, you really should try to be a team leader. It helps you get out of your comfort zone and find your inner bad***. As someone who had never done a GORUCK event, I became the ATL, assistant team leader. Our first goal was to get everyone ready in a three-minutes. That didn’t happen, so we all had to carry our packs high above our heads from the bridge to the stop light, maybe 200 yards away. We were able to take breaks, but it was up to the team leaders to set them. I moved to the back, trying to make sure the people heard the commands out front. But I don’t think everyone could hear me. I had a very hard time with this task. Cadres Michael and Flash called me on it a few times. “ATL keep your arms locked.” “No ATL, don’t drop it.” At certain points, one arm gave out while the other held it up, so my pack was slanted. I thought to myself, “I can’t do this” looking at the distance we had to cover. I may have said it out loud too. But others were struggling more than I was. It took a while, but we made it to the stoplight. When we got there, Cadre Michael pulled me aside. As I frantically tried to get my pack on, one of my chest straps fell off, again. He picked it up and questioned my ruck selection. I think at the time I said it was a “cheap, crappy pack.” I’m sorry Cami for calling you that. You now have duct tape on your straps as a result of the snake incident during the relays, but for the most part you held yourself together. Not bad for a $30 pack. Those weren’t exact words but close enough. It was like other leadership roles I’ve dealt with. I couldn’t be that tall, quiet chick in the corner. I had to let my scream out, like a bird set free. So I stepped up to the plate. I barked orders from the TL and ran instructions down the line. And as night began to fall, Cadre Flash broke out the music. “If I don’t see you dancing, you’ll do burpees,” he said as our team danced as we waited for lights to change. We made to the Steel Plaza. I did what I was supposed to do. I felt like I was really “doing me” for the first time in forever. That grin from the 2013 metric marathon was back. 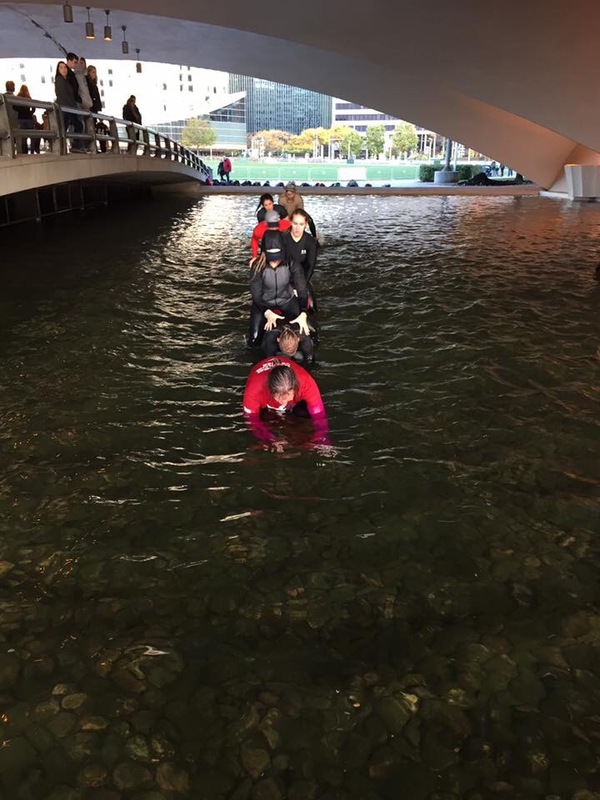 I found my moment of zen that eluded me during the 2015 Marine Corpse Marathon. Our final leadership team led us home, back to the start. Flash had people from the back of the pack run up to the front. I was ready to go whenever he pulled me out to run. It was great way to forget the cold. There were many stories told. My back wasn’t happy. Cami’s ducktaped straps where too high on my back putting pressure on an area I injured in high school. So I occasionally put my hands under Cami, my ruck, and relieved the pressure on my back. Eventually, six hours and one minute after we started to be exact, we made it back to the Soldiers and Sailors Memorial Hall. We had one more task. The four who completed the HTL led the rest of us, in three rows, up to the top of the stairway. We had to do walking lunges, arms locked together, staying in our rows. Once we got to the top, the view as beautiful and air was energized. We did it, together. Like kids egerly awaiting together their first Christmas toys of the day, we waited as the cadres passed out our patches with a handshake and a hug. Many of the teammates agreed to go out to eat afterward. I was eager to get back home to my family, but first I had to thanks Cadre Michael for his pep talk. I think that was the biggest take away from this: My interaction with Cadre Michael and what my husband said about concentrating on what I can do. I pushed myself farther than I had in a long time and I succeeded. I’m not a crowd person, so while the team building was beneficial, I really think I could have gotten more out of that aspect if a friend or group of them came with me. Note to future GORUCKers: After we finished, Cadre Michael said that if anyone had more than a 30-minute drive home to be careful. The physical effects of the event sneak up on you. He’s right, except when your “check engine” lights comes on and you’re praying to make it home safely. On the way to my car, I stopped by Starbucks for caffeine and something to eat. The wet clothes and night air started getting to me. I was shaking, mild hypothermia. I was too cold at Starbucks, so I shook my way back to the car which was nearby. Sia was on full blast as was the heat. I changed into dryer clothes and ate my sandwich. My shakes made it impossible to text my husband, so I called him for advice. We devised a strategy to get home and after I set my GPS and stopped shaking, I headed home. I got home about an hour and a half later. Once I changed clothes fully, I felt a lot better. My husband tried to convince me to take a hot shower, but the idea of going into water just freaked me out. I just got under blankets, elevated my legs and drank some wine. My legs felt the worse that night. But the next day my back, shoulders and arms that were in the most pain. Lifting anything above my head was my version of the marathoner’s after-race staircase, pure torture. Mentally, I’m still living off the GORUCK vibe. It was awesome, scary and mind-blowing all at once. I will do it again. Hopefully with friends. If I can’t actually participate in an event, I want to train like I’m preparing for one. I like the variety and overall fitness aspect. I really want to be able to carry a ruck over my head for more than a minute. Always earned, never given. That’s what GORUCK says about its patches. I did a lot to earn mine. I’m not so proud of some of the things I did, but proud that I was able to refocus at each misstep and come back better than before. I dedicated my GORUCK experience to Kirk, aka Mettle Forger, and my father and grandfather. I know they were cheering me on, smiling the entire time.